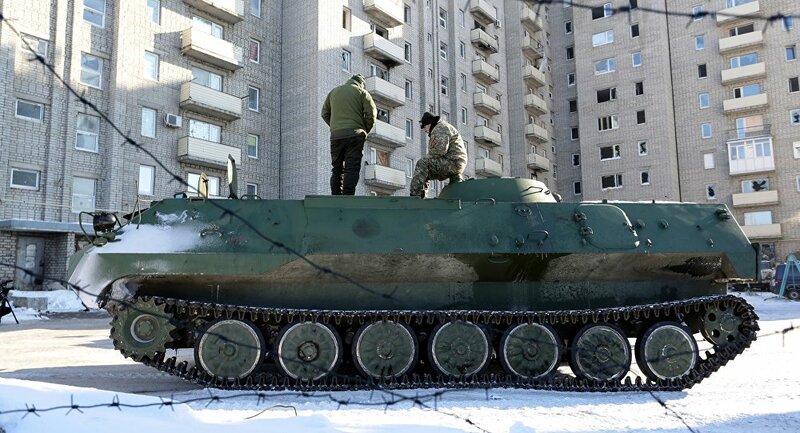 KIEV (Sputnik) — Earlier in the day, the Ukrainian media reported that Ukrainian tanks entered Avdiivka, referring to the video published on Twitter by a BBC correspondent. A short video shows two unmarked tanks near residents buildings, with military personnel and a white-color vehicle with Organization for Security and Co-operation in Europe (OSCE) flag around them. "I have spent the whole day in Avdiivka today, I have not seen any tanks, I saw one police armored reconnaissance vehicle," Matyukhin said, adding that it was necessary to check the scene of the shooting. The situation near the industrial town of Avdiivka and neighboring Yasynuvata in southeastern Ukraine has been tense for several days, with both conflicting parties having suffered casualties and civilians being deprived of running water, central heating and electricity. The Kiev forces and Donbass militia are accusing each other of being responsible for the escalation of fighting. On Tuesday, spokesman for the Ukrainian Defense Ministry Alexander Motuzyanik said that three Ukrainian officers had been killed and 24 were injured over the past 24 hours in the eastern Ukraine hostilities. While Deputy Defense Minister of the self-proclaimed Donetsk People’s Republic (DPR) Eduard Basurin said at least six people had died, 13 others had been wounded as result of the Ukrainian Armed Forces' attacks on the DPR territory in the last 24 hours.